I think half of my brain is still in Jacksonville right now. I'm definitely not firing on all cylinders. I also haven't even turned on the lights in the office yet, if you're wondering how the day is going. 100% of the inspiration credit for today's post goes to Meredith. Since the first time I set a "blog every weekday this month" goal, I've actually felt like I need to write every day, like I need to be present for all of the fantastic people that stop by every day to see what mess I've gotten myself into this week. It's great, I love blogging. I get ridiculously excited when I check my e-mail and I have unread messages from Disqus about comments [side note, yesterday I tweeted about wanting Disquis to have an app so that I could respond to comments from my phone + they so helpfully told us how to moderate via e-mail. That's the opposite of helpful guys..] I also know that if I didn't show up today, you guys would still want to be my friend, which is actually what makes me feel like I need to be here. Does that make any sense? I'm running 100% on coffee at this point. Speaking of coffee. Can we just talk for a minute about how great coffee is? I can't quite put my finger on when I stopped being able to function as a human without at least one cup, it's somewhere between senior year of college and my first twelve game homestand. Even on days when I don't have to do anything and I can sleep as late as I want, the first thing I think when I wake up is "oh god, do I have any coffee in the house?" I'm genuinely bummed that there's not a cute little local coffee place that I can walk to in Buckhead. My choices are limited to Starbucks + Caribou. I think coffee might be the linchpin in my creative process. I admit that I just looked up linchpin because I don't actually know what that means, but I've heard it said before. One of the definitions is actually the way I meant it, for some reason I always assumed it was one of those weird figures of speech. Like catywompus. I use that word all the time, I'm not even sure if it's a real word or not. Spell check seems to think otherwise. This post has been brought to you by coffee, a lack of inspiration, and the complete intention of writing about how sometimes it's hard to write even though you really want to write because you're creatively bone dry. Today, it's about forcing creativity, because some days you just gotta make it happen. 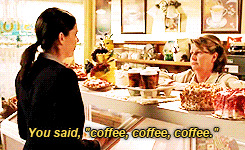 Also, I've been searching for about an hour for a gif of Lorelai saying "coffee coffee coffee!" and that lady giving her three coffees and a lot of sass. It took way too long and then I realized I should learn to make my own. I also found 22 reasons coffee drinkers are basically Lorelai... Then I went down the Gilmore Girls internet article rabbit hole and the moral of this story is that it's good that I did my work before starting this today. I just wrote over 500 words about not having anything to write about, in case my babbling abilities were ever in question. What is everyone else up to today? COFFEEEE COFFEE COFFEEEEEE! If you can't tell I also love coffee, there is this coffee place off of Howell Mill called Octane and I am 99% convinced that their coffee contains crack. We should go sometime, its addicting and will keep you up and energized for days. my love for coffee has grown tremendously since having kids. I'm convinced I run on nothing but coffee, water, and the occasional slice of pizza. I used to be a snob about it, too... gone are those days. now I'm off to get lost in buzzfeed articles related to gilmore girls. thanks. lol. If you need moral support I will proudly walk in with you. I have no shame and I will even carry my finest purse and put my hair in a sock bun. There is an awesome little coffee shop, Swift and Finch, that is close to your mommas house..
Re: Disqus, can you respond to comments on your mobile blog site? Serious question. I've never tried it. Obviously you'd have to log in to disqus, which might be a pain, but is it doable? I don't drink coffee, but I do consume caffeine in the form of Dr Pepper, and it's serious. 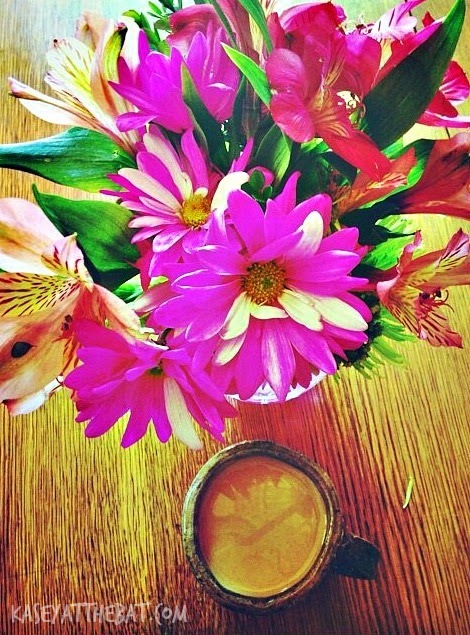 I definitely don't know how moms get anything done without coffee ! the Gilmore Girls rabbit hole is the best one to go down! yes, but it's a pain on my phone? lots of zooming + it never lets me backspace + half the time I can't get it to work. the only plus side about the blogger comment form was that I could respond to anyone [who wasn't a no reply blogger] immediately from gmail or whatever. full of judgy berry college students who think I'm ENTIRELY too loud for a coffee shop! I found it on Tumblr after a million hours of looking + it's the whole exchange! that one seemed to get the point across best!!!!! Hahaha love that article! I agree, coffee is a necessity! I don't know if I could have written 500 words about cheese though! maybe tomorrow will be all about cheese. now I want something cheesy. it's so accurate. I feel like I'm turning into Lorelai more + more as I get older! These gifs are all so on point! I saw the title of this post was "Coffee Coffee Coffee" and I immediately thought of Lorelai. Gilmore Girls gifs are the most appropriate for this topic. haha thank you! I feel like I can apply Gilmore Girls to any + all parts of my life..
aren't they great? I love it. That show never gets old!